With a diverse group of amazing guides, you'll enjoy every minute of your exciting ocean adventure! Ron grew up on the waters of the lower great lakes in Southern Ontario and spent the second half of his adolescent life in the Finger Lakes region of N.Y. on Canandaigua Lake. Once the practice goalie for Buffalo, hockey and cycling occupied his passions until venturing to the west coast where the ocean now commands his full attention. Hockey has been replaced with surfing. Between triathlon training, paddling out for a surf and on the water boating, most of his year is now spent on or around the ocean. Our guests love Ron. He is gentle yet watch his face light up when you ask him about marine mammals or local history! "Tofino has sparked so much imagination and passion for me. It's beauty is impeccable and it's history casts intriguing shadows…". After growing up in BC and spending his young adulthood traveling and sailing throughout the world, Brady made Vancouver Island home. He has spent almost 20 years sharing ecological knowledge with visitors from around the world as a both an adventure tour guide and an environmental educator. After graduating from Simon Fraser University with a B.Ed. he started teaching at Wickaninnish Community School and was the Education Coordinator at Raincoast Education Society. Brady came to environmentalism through what is likely the most conventional path; through outdoor pursuits. He grew up fly fishing, hunting, hiking, camping, skiing, and playing in the woods behind his house in the interior of BC. Like many in our community, it was through surfing that his love for the ocean developed. However, now surfing is only a small part of that passion. Inevitably, as his understanding of his environment grew, so did his interest and eventually his concern and sense of stewardship. Learning the natural and cultural history of an area as rich and diverse as Clayoquot Sound is a lifelong pursuit. Brady is excited to continue learning and in turn share that accumulated knowledge with others. Travis grew up on Vancouver Island and grew up sailing. After visiting Tofino for a weekend 8 years ago he is still here, leaving for only a short time to work on board a tall ship until he returned to Tofino and started with Ocean Outfitters. Travis lives aboard a sailboat with his wife and enjoys, surfing, camping, and paddle boarding. He is hopelessly captivated by this coastline and loves the opportunity to educate and to share what he has experienced with others. Growing up on the shores of the North Atlantic Martin has always been in love with the ocean. A passionate scuba diver he likes to spend his time above as well as below the surface. Inspired by the documentaries of the BBC and Captain Cousteau, Martin decided at the age of three to pursue a career working with whales. However, a slight detour in life took him through extensive travels and a career in marketing. Just about 30 years later he made his dream come true and joined our team as captain and guide. David grew up footsteps away from the mouth of the Fraser River in Richmond, British Columbia. He was raised by a bush pilot of Vancouver Island. The stories he learned growing up, tales of fractured coastlines, a temperate old growth rainforest, and a vast array of wildlife is what ended up drawing David to Tofino. After attaining an arts degree at Kwantlen Polytechnic University in 2007, a weekend visit to Tofino changed everything. Clayoquot Sound is now where David calls home, and where he enjoys everything from microscopic organisms, foraging coastal black bears, and our biggest visitors, migratory whales. In his off time you’ll most likely run into him exploring mountain peaks, low lying valleys, estuaries, inlets, lakes and the rivers that encompass this magnificent area we share: Vancouver Island. Born and raised on Vancouver Island Jesse spent most of his summers from the age of 12 onward exploring in and around Tofino and Clayquot Sound. Jesse's passion for the coast, wildlife and driving boats was kindled by a local back to the land family. He nurtured his love of this coastline and adventurous spirit by surfing, camping, fishing and now he feels that being able to share it with our guests is a privilege. His ultimate goal is to share his knowledge and passion for the area instilling a sense of wonder and amazement for the delicate ecosystem of Clayquot Sound. Ryan was born in the wilderness of Africa and raised on rugged Vancouver Island. His passion for adventure and true wilderness started at a young age and led him to guide people amongst wildlife. From horseback and dive safaris in Africa, to oceanic boat tours on the west coast of Canada, sharing special moments with guests and animals is a life long journey that he wants you to be part of. Florian Besson, or Flo as he's known around town, is a lifelong fisherman from the Burgundy region of France. Flo started fishing at age 6. Fishing quickly became his biggest passion and he achieved “Flyfishing Master” level. In 2006 Flo moved to Tofino where he both owns and operates Tofino’s Fly Fishing School and guides Salmon, Steelhead, and Trout fishing in fresh and salt water. You will find Flo aboard the Miss T Eyes guiding our culinary salt program. Flo seizes every opportunity to fish and is an advocate for sustainable fishing practices. He lives with his wife, and two daughters, who are now novice fly tyers. Spencer attended outdoor adventure college where he became a Sea Kayak guide. His interest in the Tourism Industry was sparked which lead to a degree in Tourism Management. When Spencer takes visitors on a remote paddle through our pristine inlets, he can’t help but find himself feeling the same sense of excitement that they have. He loves his job for one reason… when he became a kayak guide, he never worked another day! Spencer is passionate about this serene place, as it is the last remaining great rainforest on Vancouver Island. Crysta grew up in Algonquin Provincial Park in Ontario, paddling and exploring the lakes of her hometown. Her passion for marine wildlife and paddling led her to become a sea kayak and whale watching guide in Newfoundland. After finishing university, she ventured back to the ocean, this time to the west coast and has fallen in love with the wilderness and remoteness of Tofino. Crysta holds a degree in Zoology and loves to incorporate her knowledge of animals on tour, while instilling the importance of conservation and our impacts on wild ecosystems. When she isn't paddling around the inlets, Crysta can be found exploring the open coast, surfing or photographing the wildlife and beautiful landscapes of Clayoquot Sound. Satch grew up on Cortes Island at the entrance to desolation sound, where he was introduced to liquid locomotion at a very young age. From sailing all over B.C. to day trips in his back yard, he developed an appreciation and respect for the ocean that continues to grow today. After a brief stint in the city, Satch moved back to the island to study at the University of Victoria. He holds a degree in Geography with concentrations in coastal conservation, coastal and marine resource management, and whale ecology. Satch is a well-versed wilderness adventurer and educator and loves to share stories, experiences and facts about this abundant coastal zone. When Satch isn’t guiding, he is out on his 40’ aluminum cutter exploring the coast and pushing the limits of his rig. His passion for guiding comes from a deep connection with the sea, a place that will only continue to provide if it is respected and preserved. 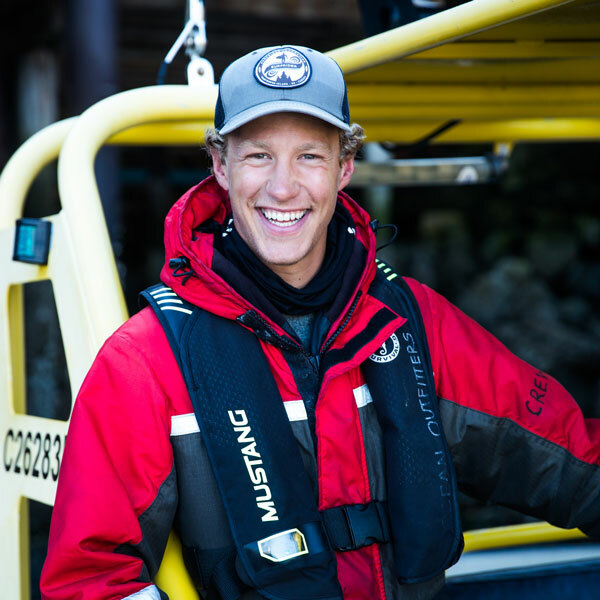 Born and raised on Vancouver Island, Kyler loves the outdoors including fishing, surfing, camping, and adventure. Kyler has a diploma in professional photo imaging. You’ll never find him far from his camera. Before he moved to Tofino, Kyler worked as a fishing guide and led photo workshops in Haida Gwaii. Kyler loves being on the water and has a deep appreciation for the natural beauty of Clayoquot Sound. Kyler guides both our adventure programs and our fishing charters. We can thank Kyler for the stunning wildlife images in our Adventure Centre. He also has his own gallery in Tofino where you can purchase his images.